Dare to enter this abandoned amusement park that has been out of touch with the world for many years. 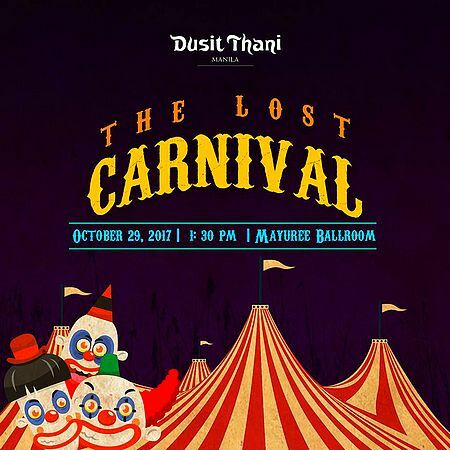 Old and rustic, feel the dreadfulness and creepiness of Dusit Thani Manila's The Lost Caarnival on October 29, 1:30 p.m. The brave ones will witness and experience The Acrobat Show, Ventriloquist Show, Best in Costume Contest, Carnival Activity Booths, Trick-or-Treat Activity, Kiddie Fashion Show by Osh Kosh B’ Gosh, and more. Tickets are priced at P1,000 for one adult and one child, inclusive of snacks and access to the event. Dusit Thani Manila is at 1223 Epifanio de los Santos Avenue, Makati City. For inquiries or reservations, call 238-8888 local 8439 or 8838.